Notice anything funny about Santa? The prince and I decided to include Old Saint Nick in our annual holiday portrait session. 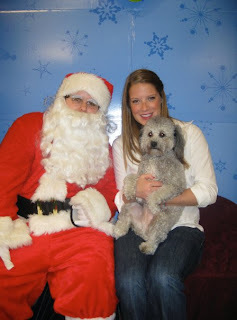 After researching all places to visit Santa, I found that at PetSmart they'll take you and your furry friend's picture with Santa for $10. JACKPOT. And, all the proceeds visit the North Texas SPCA. DOUBLE JACKPOT. So one Sunday afternoon, we trucked it into the store for our photo session. Upon arrival I immediately groaned at the sight of this piss-pore Santa. Manfriend insisted we stay for the comedic value. As we waited for our turn, it became clear that Santa was not only a woman, but a woman that liked other women. I was one of the few in line without a small child, so judging by my own discomfort, I can imagine the Dallas housewives in the queue with me were absolutely horrified. This social tension amounted to total hilarity. Per my usual Sunday sluggishness, we were the last photo of the day and Santa was just getting off duty. As we were waiting for the picture to print, Santa began to de-robe right in the middle of the store. As she began peeling away her Santa suit, which had gotten uncomfortably "sweaty" (so she reported to the crowd of strangers watching in amazment), she exposed her Texas aTm t-shirt and man jorts beneath. VOMIT. Then as the red felt pants dropped to her ankles, she revealed her calves to be covered in tatoos of pinup girls. At this point I'm staring and can't stop. She replaced her Santa cap with an aTm baseball hat, which proved to be the crown jewel atop her completly ridiculous appearance. But, she forgot to take off the stick-on gray Santa eyebrows and walked away cooly to "go out back for a smoke." After her departure Manfriend and I both were nearly exploding with commentary and giggles. Comedic value of this little endeavor proved priceless, good call manfriend. I feel a little guilty for being so appalled at this woman. I like to think of myself as a liberal, worldly, accepting kind of person. Apparently not. This lady was just so ridiculous I almost couldn't be polite. The best part of it all was the shock that all my loved ones received in their mailbox. Several of them have followed up with a strong "WTF?". From now on I think I want to deliver comedy as my holiday gift to others. Probably will take me the whole year to figure out how to top this one. I can't not say it, and this is a whole other topic for another time, but aTm people are so freaking wierd. As soon as I think they're as freaky as they can be, they out-freak themselves.